Food and Whining - A modest outlet for a mediocrity-weary diner. I’ve never quite grasped the allure of grapefruit. Rather, eating the fruit by itself (usually photographed with half a neon-red cherry stuck in the middle to hide the navel-like cross-section of its core.) It was once the very icon of dieting; as if punishing yourself first thing in the morning with bitterness would lead to losing weight. If anything, I’d imagine it makes you crave something sweet which kinda goes against the point. I can count on one hand the number of grapefruit I've purchased in my lifetime; two of those were in the last month. Judy Rogers, the late chef of Zuni Cafe in San Francisco, includes this recipe in her brilliant cookbook. She admits that even the mention of this dish gets the most bizarre responses from her rookie kitchen staff. Still, there are a variety of recipes that befuddle at first but almost haunt with their absurdity. I’ve certainly been surprised before (yogurt pizza dough anyone?) so I had to try it. It’s a little hard to describe the results except to say it doesn’t taste like you think it would. In one of those magical, chemical moments, it all comes together into a unified and surprisingly simple dish. It would be tough for most people to guess the odd ingredient as cooking transforms both aroma and flavor. Fittingly, I made this alongside a simplified version of her roasted chicken recipe. Add just enough stock to cover the rice well and bring the heat up to medium or so. Repeat this process but remember stirring continuously just makes you tired. Creaminess will happen just fine on its own. At the last minute, stir in the marscapone for a minute or two more to warm and combine. 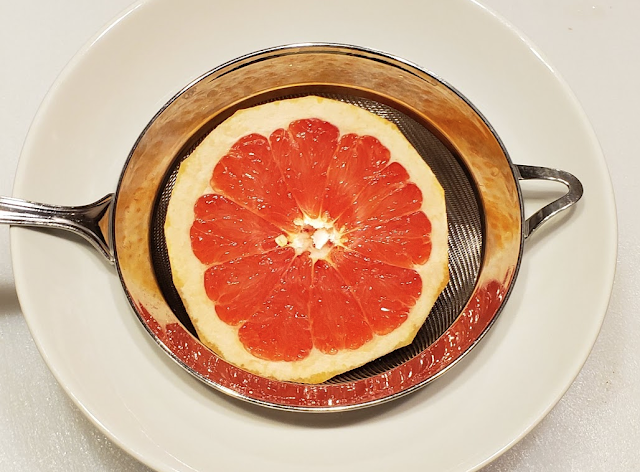 Again, the result isn’t what you'd think and it doesn't scream “grapefruit” making this a great side dish for fish or chicken and maybe even a steak with an Asian-style sauce with ginger, soy (sauce or miso), and certainly rabbit. However, the risotto by itself seemed a bit sparse. Fortunately, I had most of a fennel bulb loitering around so I roasted it. I admit to not roasting fennel quite often enough and it fits beautifully with the risotto. If serving with chicken, I’d let it roast until well browned but with fish, I might lower the temperature and back off on the time by about 5-10 minutes to keep the flavor brighter and retain more of the anise notes. Toss the fennel in the oil in a big fat roasting pan or wide fry pan and sprinkle with salt. 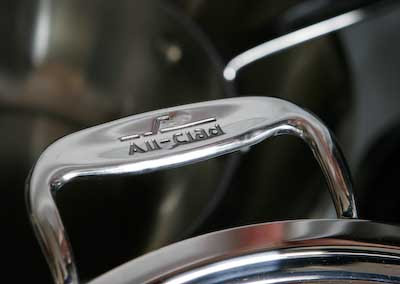 All-Clad - Is it "All-That"? In any activity, using the best available tools is ideal. While that pursuit is often tempered by budgetary restrictions, budgeting for and spending what is necessary on quality tools for cooking is almost as crucial as what is spent on ingredients. I was reminded of the importance of such tools while preparing dinner at the home of my friends Rick and Erica. I had decided steaks were to be the main course so I grabbed a somewhat thin, but serviceable, pan from their cupboard, cranked up the heat on their electric cooktop (notably identical to the one featured in the Brady Bunch), and parked the pan on those familiar glowing coils for a good preheating. In retrospect, maybe April 1st wasn't the best day to notify my friends that I was "giving up meat". It was an announcement met with skepticism, suspicion, and downright fear. (People seem to fear zombies, who consume human flesh, as much as humans who choose not to eat the flesh of other animals.) It's hardly a day to announce anything of a serious nature, but that was exactly the point. I didn't plan on the timing, it just worked out that way. Few revolutions occur by choice and even fewer are implemented at the optimum time. Such decisions tend to sound as if they sprang forth in a single moment of inspiration. The reality (to which I can attest) is that this kind of change is usually long in coming and even longer in implementing. I can also vouch for the fact that such changes should often happen sooner than they do. If your "gut" tells you something, pay attention. Doing something repeatedly and getting a result is called persistence, but when nothing changes, we call it insanity. Between the two is a very fine line.